Last Friday, my Ph.D. student, Alida Mercado Cárdenas successfully defended her Ph.D. Congratulations, Alida! This is a really big event, and the entire laboratory is so proud of Alida. 40,000 beetles, 73 Families, 355 species or Curculionidae, 112 species of Histeridae. 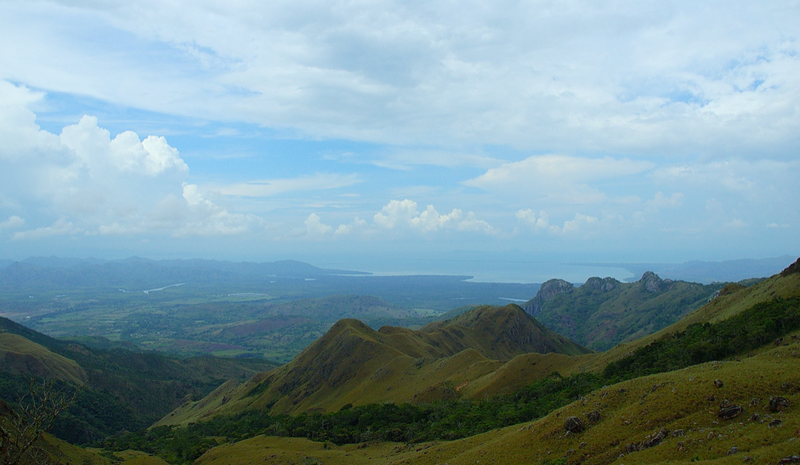 In case you weren’t already convinced, the tropics represent the heart of biodiversity science. …so many beetles, so little time. 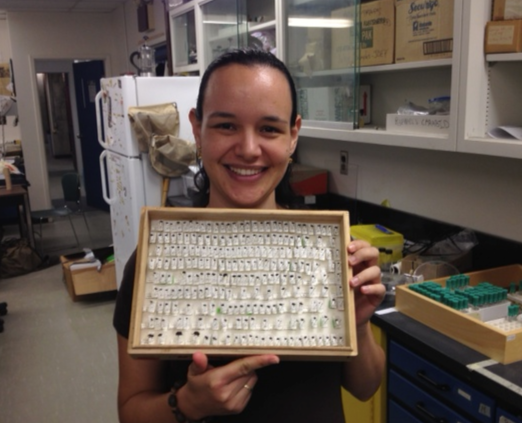 Alida, quite literally, looked at almost 40,000 beetles. This is stunning, and astounding. Here’s a photo of her with a small sample of these beetles, and she’s still smiling!! Alida with a few of her beetles. 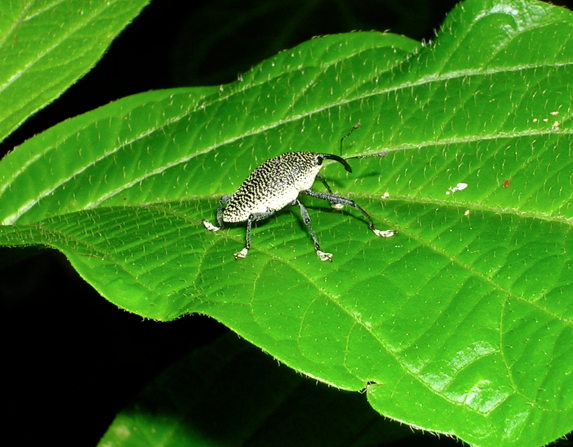 Alida’s thesis is ambitious, fascinating and contains some important conclusions: a) from the beetle’s perspective it matters whether a rainforest is next to shade-grown coffee compared to a pasture, b) beetle assemblages are unbelievably variable in the neotropics – in fact, she often discovered as much variation between her traps within 100’s of meters of each other as between different locations, c) seasonality (i.e., rainy/dry seasons) influences beetle communities, and d) there are a lot of species still to be described – for example, of the 355 weevil species that Alida identified, less than half of these have a name. To help with this significant taxonomic impediment, Alida collaborated with a beetle taxonomist (Alexey K. Tishechkin) and described three new species of Histeridae. This is a wonderful part of her thesis, and showed that it is possible to combine different disciplines – in this case, ecology and taxonomy. The”official” defense that happened last week represents the end point of a long, productive, and lovely time with Alida being associated with the arthropod ecology laboratory. I began at McGill in September 2002, and Alida came to do her MSc just a year after I started. Her Master’s was about Carabidae (ground beetle) assemblages at and near the Morgan Arboretum, and she published two fine papers from this work – one about introduced Carabidae and another about successional patterns . After her MSc, Alida successfully entered McGill’s NEO program, and begin her PhD on beetles of the neotropics, with Dr. Hector Barrios as a co-supervisor. The rest is a successful story of beetles, beetles and more beetles. Alida is kind, caring, intelligent, motivated, and a very talented academic. I am pleased (and proud) that she is officially finished at McGill, but I will also miss her. Congratulations, Alida, and good luck with your next adventure! Arthropod research, Graduate students, Laboratory News, Where are they now? I studied college in méxico with Alida 1998-2003, we were roomies! and I had to sleep next to her very first beetle samples, and now to see her achieving so much just makes me proud because I was there when she started! !..shes is great and a very proffesional now Dr!!!! All my love. Natalia from méxico. I am so proud of Alida! We are friends since our days as undergrads. I did not know about the huge amount of work she did for her PhD, but as I see it, it is just in her nature to be such a hard working, constant and focused scientist. I admire her endurance, and passion for what she likes and does. Felicidades man!!!!!!!! Alida´s work is really remarkable. As a friend of her family I am very proud to realize the importance of her work and her commitment to achieve what he has done.